The following is a brief recap of the Tues., Oct. 16, 2018, BPS101 Regular Board Meeting. View the agenda and all supporting documents from this meeting and minutes from previous meetings. 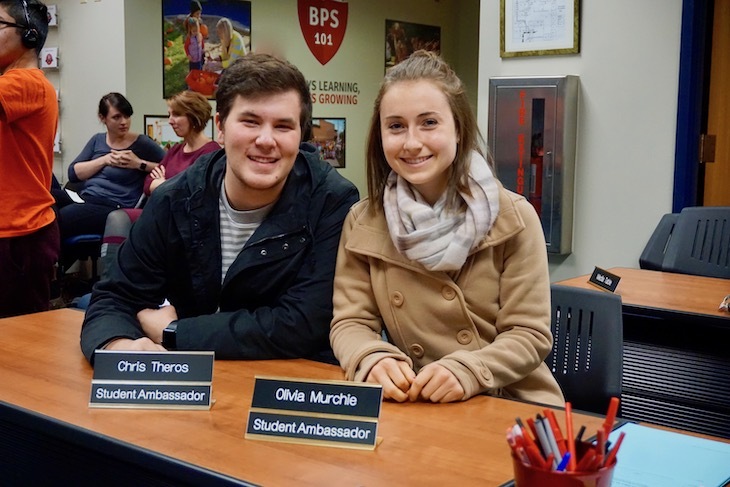 Student Ambassadors to the Board of Education, BHS senior Chris Theros and BHS junior Olivia Murchie, updated the Board on the progress that has been made to decrease the time it takes for students to make copies at BHS. Both Chris and Olivia brought up this issue at the last Board Meeting and created an action plan to help solve it. Now that changes have been implemented, including movement of a copier and a faster login procedure to print, the Student Ambassadors told Board Members that feedback from BHS students and staff has been extremely positive. This is a great example of how Student Ambassadors are a valuable conduit between the student body and the Board of Education. Chris and Olivia are also this week’s hosts of the Twitter feed @BPS101Pride, so follow along as they share their perspective on #BPS101Pride! In November 2017, the Board of Education commissioned a Facilities Committee consisting of staff and community members. The committee has been meeting monthly and has made progress toward the goal of developing a long-term master facilities plan for 2021 and beyond. Members of the committee presented their final report to Board of Education at the Oct. 16 Board Meeting. The presentation focused on the standards and rating scales that the committee developed, facilities assessment results, and recommendations for moving forward. Board members are reviewing this report and, over the coming months, will be developing a plan to remediate the unsatisfactory areas beyond the capacity of existing budgets/teams, studying cost estimates and finance options, and setting a fiscally responsible improvement timeline for FY21 and beyond. BPS101 Director of Operations Mark Anderson presented the Board with a Capitals Project Plan (CPP) developed by the Capital Projects Committee to identify, prioritize, and schedule the maintenance of District facilities and assets over the next four years. In developing the CPP, the Capital Projects Committee prioritized work based on urgency for the next four fiscal years and will revise the plan, as needed, to incorporate recommendations from the Facilities Committee in fiscal years 2021 and beyond. In accordance with BOE policy 6:160, Chief Academic Officer Dr. Brad Newkirk presented the Board with the annual monitoring report on the District’s English Learner Program. This report, prepared by BPS101 EL Director and HCS Principal Anne Paonessa, includes the number of students enrolled, student academic performance, cost of the program, program highlights and more. Dr. Newkirk shared from the report that there are 28 languages other than English spoken in BPS101 students’ homes and that the top six languages are: Spanish (145), Farsi (21), Arabic (11), Cambodian (5), and Nepali (3) and Polish (3). In accordance with BOE Policy 6:270, Dr. Newkirk presented the Board with the annual monitoring report on the Guidance and School Counseling Program. This report, prepared by the counseling and advising staff at Batavia High School and Rotolo Middle School, details the results of their work during the 2017-2018 school year and provides information on what they have planned for this school year. Dr. Newkirk also presented the Board with a primer on the Every Student Succeeds Act (ESSA) to prepare the Board and community for the release of the 2018 school report card on Oct. 31. The report walks through the significant changes to the state accountability systems resulting from the implementation of the federal Every Student Succeeds Act—the law that replaces No Child Left Behind. Dr. Newkirk made note that while changes to the state accountability systems are still in progress, BPS101 staff members remain committed to continuous improvement and that we have the capacity to help every child succeed.